April 2019 Introduction: When I first wrote this post (in 2012 and revised in 2014), I had to order all my beekeeping supplies from Beemaid in Manitoba. I never had a problem with anything I purchased from Beemaid. The hive components, smokers, bee jackets, pollen patties — everything was top quality at a good price. But shipping from Manitoba was expensive, usually clocking in at around 40% of the total cost before taxes. Crazy. Today, fortunately, G & M Family Farm in Freshwater sells all the beekeeping supplies most new beekeepers would ever need to start beekeeping in Newfoundland — and that makes it much more affordable than it was when I got into beekeeping in 2010. Many people in Newfoundland over the years have ordered from Country Fields out of Nova Scotia, but I always found I got a better deal from Beemaid even after the shipping costs. The best deal I ever had was from Lewis & Sons out of Manitoba. Had I discovered them years ago, I would have saved a fortune. Large bulk group orders from them (several hundred pounds) even today might cost less than ordering locally. But generally speaking, G & M seems like the way to go. I don’t have time to completely rewrite this post, but I have done a quick breakdown of the cost of starting up two hives if I bought everything from G & M today, and the grand total after taxes comes to $1,440. That includes the price of two nucs and all the hive components (unassembled) for two full hives, including a feeder for each hive, plus a smoker, gloves, hive tool and veil for one person. That doesn’t include the cost of shipping, though I get the impression that the cost is minimal on the Avalon portion of the island, but I’m not sure. The cost for a smoker, gloves, veil and hive tool is $167 after taxes. It’s about $100 more for a full beesuit instead of the veil. (Lighter items such as beesuits might be cheaper to order in from Beemaid. It might also be worth taking a peek on Amazon for some deals.) And this is the cost of the bare minimum requirements. It’s always good, perhaps even essential, to have the components for a full hive in storage after the first year because it doesn’t take long for the colonies to grow and run out of room. However you look at it, for someone starting from absolute scratch, $1500 for two hives seems to be about right. All of this might seem a little high, but I’m pretty sure I paid twice as much when I started out in 2010 and had to ship everything in from Manitoba (so it’s getting better). The start-up costs are pretty steep for some people, but the good news, I guess, is that the costs go down after the second or third year (in theory, anyway). First of all, if all goes well, the colonies will build up on their own and you won’t have to buy nucs anymore. Maybe some mated queens, but no nucs. 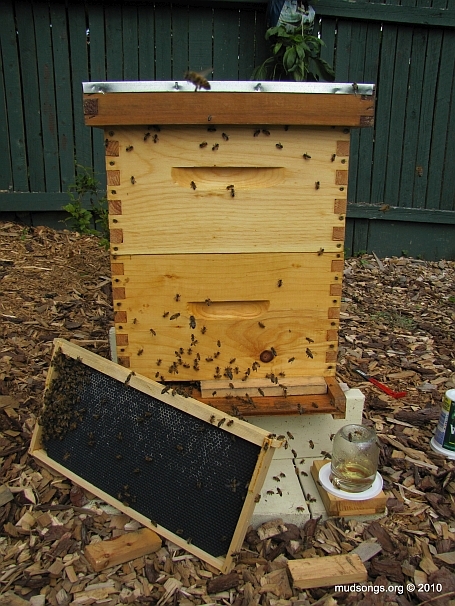 Certain hive components such as bottom boards, inner covers and top covers are cheap and easy to make. All you need is some wood and a handsaw and minimal carpentry skills. The D.E. Hive sold by G & M is an excellent hive design, but the bottoms and the tops of the hive are expensive compared to those of a standard Langthroth hive. The homemade standard Langstroth components might reduce the costs by about $100 per hive. But no matter how you look at it, beekeeping ain’t cheap. Not for working class slubs like me anyway. The good news — and this really is the good news — is that raw honey sells for about $12 a pound (or more) and it doesn’t take long to recoup the start-up costs by selling honey. I order all my beekeeping supplies from Beemaid in Manitoba. Their prices are so low that even with the expense of shipping half way across Canada, it’s still cheaper than ordering from any suppliers I’ve found in Atlantic Canada. The cost savings for beekeepers able to make their own wood components are even greater. (Check out my How-To page for information on building certain hive components.) But assuming someone has to start from scratch and order all the necessary beekeeping equipment and hive pieces in one order, the cheapest and simplest option is to go with a single Langstroth hive with conventional frames and no honey super. April 2019 Comment: Two hives are much better than one, though. If the bees in one hive are slagging behind, you can steal from the strong colony to boost up the weaker one. When you’re stuck with one hive, if something goes wrong and you don’t have spare parts or extra brood to steal from another hive, you’re hooped. Necessary items not listed below are nails, screws and tools needed for assembling the hives; 40-80kg of granulated sugar for mixing sugar syrup; a spray bottle for misting the bees when a smoker isn’t necessary; mesh for mouse and shrew proofing hive entrances in the winter; paint for the hives; and the hard insulation and Type 15 or 30 asphalt felt used for wintering the hive for those who wish to winter their bees that way. (Again, see my How-To page for more info on all that.) Those extra items will come to about $100. Not including the cost of the nuc. April 2019 Comment: Something that should be obvious but maybe isn’t to everyone: It’s illegal to bring honey bees onto the island of Newfoundland, whether through a retail supplier or in the back of your truck. Honey bees in Newfoundland have never been exposed to Varroa mites nor most of the diseases that are affecting honey bees around the world. They require exceptional protection. With the correct permits, honey bee packages can be imported from Western Australia, but that’s not what I call exceptional protection. I’m dismayed that the NL government supports importations when it could easily provide beekeepers with the resources to build up Newfoundland honey bee colonies in a self-sustaining and guaranteed safe manner by using local disease-free bees. Okay then, here’s the one-shot hypothetical order for anyone interested in starting up a single Langstroth hive in Newfoundland in 2014. Note that the prices listed for each item are from 2012. The updated 2014 prices are slightly higher, but I don’t have time to update all those images from my original order. Bottom Board. I build my own board boards these days (see the How-To page for info) because they’re cheap and easy to make, but having a few “real” bottom boards starting off is nice. April 2019 Comment: The bottom board for the D.E. Hive sold by G & M is $55. I have no problem with the D.E. Hive. It’s a beautifully designed hive. But a standard Langstroth bottom board is way cheaper and really easy to make. Deep Supers (x2): I’ll never have the patience to build these, so I buy them. Frames (Deep) (x20): These are way beyond my ability to build myself, so again, I buy them. April 2019 Comment: Extra deeps (or deep supers or hive bodies) and frames are great to have around. So are inner covers, bottom boards and top covers — basically the components for another hive. I already said this, but having a little extra stuff around comes in really handy at times, especially after the first year. There’s nothing worse than needing room for the bees to grow and not having it. Foundation (Deep) (x20). Save $22 by going foundationless. I would also go with black foundation if possible instead of the white foundation shown here. It’s easier to spot young brood on black foundation. Learning how to spot young brood is important. Inner Cover. These are fairly easy to build too, but I guess it’s nice to have a “real” one as template when starting out. Top Cover. These things weigh a tonne. They’re expensive to ship, but it’s good to have a properly built cover, again, to use as a template for building them at home. April 2019 Comment: The inner covers and top covers sold through G & M are different because they’re designed for the D.E. Hive which looks similar to a standard Langstroth hive except it’s turned 90 degrees so that the bottom and top entrances are built into what would normally be considered the long side of a Langstroth hive. (My write-up on the D.E. Hive explains all the differences.) The D.E. Hive also has what’s called a vent box on top, which adds to the cost of the hive but provides ventilation similar to my ventilation rims. Again, there’s nothing wrong with the D.E Hive (I’d recommend it for anyone who can afford it), but cheaper options are available if necessary. Frame Rests (x4). These aren’t necessary, but it’s easier to remove sticky frames when they’re resting on metal frame rests instead of wood. April 2019 Comment: G & M sells what’s called a chimney feeder and a German style feeder. Both can be used instead frame feeders. Each feeder has its pros and cons. They all get the job done. Entrance Reducer. I use blocks of wood for entrance reducers, but I did like having a real entrance reducer when I started up my first hives. The entrance reducer is used when the population is small. The reducer comes off once you see the bees are being slowed down by the reducer. Queen Excluder. I didn’t need an excluder until my second summer, and even then I didn’t use it much, but I use them every summer now. Hive Tool. Various types of hive tools are available (I particularly like the so-called Italian or J-hook hive tool), but this one is good enough to get started. Frame Gripper. I often use my hands to pull out frames, but a frame gripper definitely comes in handy with frames that are heavy with honey and especially when frames are glued to the hive with wax and propolis. I wouldn’t skip this one. April 2019 Comment: G & M doesn’t sell these yet, but they’re easy to find on Amazon. Don’t get a cheap one, though. Smoker. I usually spray my bees with a fine mist of water and sugar instead of using a smoker. It’s less disruptive to the bees and it often works better than smoke. But the bees don’t always play nice, especially in the fall, and that’s when I’m glad to have a smoker close by. I prefer the higher quality Dadant smoker over the one shown here. April 2019 Comment: The smoker sold at G & M is pricey. Even though much cheaper ones can be found on Amazon, if you stick with beekeeping, you’ll love having a quality smoker on hand. Bee jacket. The traditional bee hat and veil with a denim shirt works for me. So does the full-body bee suit (and it’s only about $10 more than the jacket). But on hot summer days (a.k.a. beekeeping weather), a full sized bee suit cooks me like a Sunday roast. I strip down to minimal clothing when I put it on. The bee jacket can get hot, too, but it’s much less of a hassle to put on and take off. Bee suits made from a mesh material are available (I have one and I love it), but they’re not cheap. April 2019 Comment: The full beesuit is overkill. It’s just too damn hot. I still have a couple on hand for when I need to dig into the occasional big mean hive, but these days I usually get by with the veil hat sold through G & M. I have a ventilated bee jacket as well (purchased through Beemaid), but I’ll tell you right now the ventilating material barely makes any difference. When it’s over 20°C, I’m soaked in sweat no matter what. Gloves. Some people don’t use gloves. Some people don’t use veils either. I’m not one of those people. Rubber gloves provide a cheap alternative that works well most of the time. I left my leather gloves outside for a week last summer and they got so moldy I threw them out and haven’t replaced them. April 2019 Comment: When my bees look grumpy or start to get defensive, I put the gloves on. Starting out with nucs, though (with a small number of bees), it’s pretty easy to go gloveless, and it’s fun to feel the bees crawl all over your hands. Just move in slow motion and everything should be okay. April 2019 Comment: I just buy protein patties from G & M now because it’s cheaper and easier than shipping in the powder. April 2019 Comment: All the prices and calculations after this are way out of date, but I’ll leave them in for… posterity? All of this is only a rough guide to how I would start up my first beehive if I had to do it all in one order and couldn’t build anything myself. Some people would want to double up on the hive tools and the protective clothing if they’re not the solitary type. Some might also decide to do without certain items, or make some of the hive components on their own, but I’d say $400 is about right for the bare minimum hive components, protective clothing, bee food and hive tools. Plus $200 (to $250) for the bees and at least another $100 for sugar, nails and other miscellaneous items, adding up to a grand total of $719.76, or somewhere in that ballpark. Knocking that total down isn’t too hard for people who can build some of their own hive components. But I think it’s fair to say that most people end up spending more money than anticipated anyway. So I’d say $700 is realistic, and about $400 for every additional full hive probably isn’t too far off either (assuming that each hive is started with a purchased nuc). The cost of nucs is removed at a certain point for anyone who can split their hives. It’s not too hard to make bottom boards, inner covers and outer covers, but building deep supers can be a little tricky and expensive for anyone (like me) who doesn’t have the proper tools (e.g., table saw with dado blade). So here’s a total that excludes all the hive components except for the deeps and the frames: $316.63. I’ve also noticed that Beemaid (in this example) calculates shipping online, but they will package the components for each order as efficiently as they can so that the actual shipping costs are often considerably lower than the online estimates. So depending on what a new beekeeper can build on their own, the costs will range anywhere from $568.76 to $719.76 for the first hive. If they’re lucky enough to get free bees from a local beekeeper (a savings of at least $200 per hive), even better. For a more detailed guided tour of beekeeping on how to get started, check out the How-To page and my YouTube videos; or read about me building my first hive and go through subsequent posts up to today. It covers a lot of ground. All of the above only includes everything I used to get through my first year of beekeeping (beginning in 2010) and it worked well for me many times over. That’s the experience I’m speaking from. In the second year, I bought two honey supers (or medium supers) for each hive (because I started with two hives), plus frames and foundation for each super. I bought some extra deeps and more frames for them, because it’s always good to have spare parts for expanding colonies and other unanticipated events. I also had to buy jars for storing my extracted honey (using another beekeeper’s extractor). There’s more, but most beekeepers will probably know enough before their second year to know what they’ll need for that year. Good luck. This entry was posted in Building Stuff, Equipment, Mated Queens, Money, Nucs, Queens and tagged Practical Tips. Bookmark the permalink. Wow. A nuc is much cheaper here in Florida, less than $100 with a marked queen. Its definitely a cost savings to not have to buy insulation. Im not running internal feeders either, or using a frame grip or gloves. I can drive to pick up my nucs so thats a savings there too. Many things can be made and you can cut your own boxes but when I priced it out, I buy from Dadant here in the US, having them cut the boxes is only $10 or so more than buying the lumber and doing it myself. The cost isnt worth the time. Hence, the difference between beekeeping in Newfoundland and… pretty much the rest of the world. On the other hand, we don’t have Varroa mites in Newfoundland. No medications, no chemicals in our hives, nothing. So you like your frame gripper? I’ve debated about getting one. I was told when I started (just last spring) that I wouldn’t need one, so didn’t get one then. But it takes me so long to do my inspections (or anything, really, in the hive), and if the frame gripper shaves some time off of my in-hive work, then it would be worth it. Your costs are pretty similar to UK costs. Except we can get free bees by collecting swarms if we’re lucky. I hear you. I still take too long to do most of my full hive inspections. That’s part of the reason why I’m leaning towards low-impact beekeeping, only inspecting when I absolutely have to. The frame gripper can help speed things up once you get used to it. I find it’s also good for loosening frames that are stuck down with propolis. Sometimes there’s no wiggle room and the frame gripper allows you to unstick the frame by carefully pulling straight up. I don’t use it all the time, but there are situations where it definitely helps to have it. Yeah. Again, I think I could handle beekeeping in the UK. It seems similar to Newfoundland. But better. At least in some ways. I’m hoping over the next couple of years to release a few swarms to start some feral colonies here in Newfounland where I live. I just need the right bees to allow overwintering due to our short summers. I would love to be able someday to catch a feral swarm here in NL. As for the frame grippers, not necessary but useful. Especially when the bees are boiling out over the hive so you don’t squish to many. Wow! Lots of great information. After reading your warning I think I am going to put off beekeeping for another couple of years. Maybe when we can teach the kids to stay away from the bees!! Great to know there is a source for information on keeping bees in NL. It seems like there is nothing easy about homesteading here! Keep up the good work! Maureen, I don’t think you’d have much trouble keeping bees where you live and keeping them away from kids (judging from what I could see on your website). Put the hives in an out-of-the-way spot where they’ll get some sunlight throughout the day, and most of the time you probably won’t even notice the bees are there. The hives are more of an issue where I live because we have a tiny backyard and our neighbours are bit too close for comfort at times. But it looks like you have plenty space to give the bees all the room they’d need without bothering anyone. We plan to set up a couple hives on a friend’s property in the city this year. (We have a large field on our property behind our house, and it’s frustrating that we can’t use it because of local vandals.) Our friend has grandchildren that visit on a regular basis, and he even mows his lawn once a week, but we don’t anticipate any problems because the hives will be set up near an edge of his yard far from any area where people normally walk or do anything. Even when he mows his lawn, he’ll be about 20 feet away from the bees, and it should be fine. I’ve ordered the equipment that I’ll need to start two hives this year from Bee Maid Honey from your list but they were good enough to let me know that the foundation I ordered won’t fit the frames I ordered, I hadn’t ordered the permadent foundation which you and they recommended. The only thing is they only have black which is normally used for brood rearing. However they think that this won’t be a problem for the bees as they can’t see it anyway and it’s easier to see the brood in it when inspecting. Do you have any thoughts on this? I’ve ordered 2 nucs from Nfld Bee Company so fingers crossed that they will be able to supply them. I wanted to get the hives set up well before the bees come so I can become familiar with the equipment. I’m trying to decide where to locate the hives in the garden and you said in your post that 20 feet from any activities would be o.k? The optimum place in my garden would be right at the edge of the vegetable garden which probably wouldn’t be wise? But it’s the one spot that gets the earliest morning sun. Decisions,decisions! The only thing is they only have black which is normally used for brood rearing. However they think that this won’t be a problem for the bees as they can’t see it anyway and it’s easier to see the brood in it when inspecting. Black foundation makes it easier to see the brood, the little grubs curled up inside the cells, but it doesn’t make any difference to the bees. I have plenty of white foundation in the brood chamber. It’s not a problem. As for placing the hives, as long as they get some sun and the bees’ flight path doesn’t intersect with a human walkway, it should be okay. I don’t have a table saw yet, and I don’t know how to make the jig he’s using in the video, but I know someone who can probably make one for me. After shipping and taxes, each hive body (or deep super) from Beemaid costs us about $23. Sometimes slightly more or slightly less, depending on the size of the order. But $23 is probably average. I have to buy at least 10 deeps this year, and paying so much for shipping is getting old fast. I’ve found two people who are willing to make supers for me for practically nothing (I’m going to pay them in honey). I think I can get the lumber I need for less than $6 per hive body. Even if the costs maxed out at $10 per deep, the savings will be significant. If I only wanted two or three hives (enough to keep most hobbyists happy), I’d just bite the bullet and pay full price and move on. But I plan to expand my number of hives every year for the next few years. If I keep shipping in my wooden ware from Manitoba (or even New Brunswick, which wouldn’t be any cheaper), the costs are going to add up fast. I don’t know what I can do just yet. First I need to know I can get the lumber at a half decent price. After that I’ll probably get someone to show me how to make the supers. Once I know I can make them myself, I’ll probably invest in a simple table saw. If I can find a way to make supers myself (and other wooden ware), it’ll be a game changer for us — and I think it would be more satisfying to know that I built the hives myself. I’ll still have to order frames, but frames don’t way a thing compared to top covers, bottom boards, hive top feeders and supers. I’m not a wealthy man. Those numbers hurt. If I wasn’t building our own supers, bottom boards, inner coves, top covers and hive top feeders this year, the shipping costs would be drive me mad. More mad than I already am. Beekeepers who can drive to a beekeeping supply store have it so easy, don’t even talk to me about your troubles. Try beekeeping in Newfoundland. Argh! I have to turn this into a business or some kind by next year. Just so I can break even. This post has been updated to reflect 2014 prices. If you ever buy a table spend will and get a good one. I learned the hard ways with a simple cheapo. It could not hold tolerance. Then I bought a good one that I still use today. I just finished building two KTBHs 48 inches long and they cost me a total of $125.00. All of the top bars I made by a series of saw cuts to include the VEE for comb building. If I counted my time $35.00 per hour they would be priceless. I am a retired industrial electrician with a lot of free time so that cost dosen’t count. My wife and I live just outside of Buffalo, NY.. Bees are the highest cost for me. I did order two packages due in mid May. I also built a swarm trap maybe I will get lucky and will have to build some more TBHs. Then again I can use the trap as a split while I build another TBH. I just got the best deal I’ve ever had on hive components through Lewis & Sons out of Manitoba. They manufacture hive components that are sold through most beekeeping retailers across Canada. Beemaid (Manitoba) = $480 before shipping. Country Fields (NB) = $495 before shipping. Tuck’s Bee Better Farm (NL) = $650 before shipping. If a handful of NL beekeepers were to place a large single order, enough components for two or three full hives each, something in the range of 3 to 5 hundred pounds, the savings would likely be pretty sweet. I wish I’d discovered Lewis & Sons years ago. I would have saved a fortune. The ordering page for Lewis & Sons isn’t up and running yet (they’re working on it), but I emailed them a list of exactly what I wanted (including foundation that isn’t on their website’s product page) and they had it all. They eventually sent me a PayPal link that allowed me to pay for the order online. The order hasn’t arrived yet (it’s being sent out today), but so far, I’m happy a customer. The order from Lewis and Sons arrived and all the components look good. A few dings and cracks and minor imperfections here and there, but I assembled a few frames, banged together a deep and I can’t see any problems. The foundation was standard black with a wax coating. It’s all good. My guess is they build and sell all types of wooden ware, items not listed on their website such as medium supers and medium frames, etc. I suppose they’d probably send their inventory to anyone who emailed and asked. Anyway, I would have saved thousands of dollars if I’d ordered from them since I started beekeeping in 2010. I tried ordering some stuff from Lewis and Sons but the shipping charges to Eastern Canada was a lot. The prices on their hive parts are fantastic. Country Fields is now located in Waverly, NS, and their shipping charges for my order were about 1/4 so it was worthwhile to stay ‘local’. If I was ordering large amounts, it would likely benefit to go to L & S, but I found Country Fields great to deal with. I agree with all of that. Lewis and Sons usually fill out orders for retail companies and commercial beekeepers who place large orders, and for those people, Lewis and Sons can’t be beat. I only ordered 6 deeps, 100 frames and 100 sheets of foundation, which is not a huge order, but it was large enough to make it worth their while and for me to get the best deal I’ve ever had. I’d like to see the NL beekeeping association pool their resources and place a large order from a place like Lewis and Sons to make hive components more affordable to new beekeepers in NL.